An important element of our organizing strategy is to form a caring and supportive community where we can confront historical barriers of ethnicity, race, class and status. In New Sanctuary Movement trainings, members join together to deepen the base of our grassroots organization. Each training session is an interactive time of action and reflection that empowers and educates the participants. The New Leadership School is an intensive five-month course for emerging immigrant leaders. In partnership with Training for Change, New Leadership School educates immigrant leaders to organize for change and immigration justice in Philadelphia. 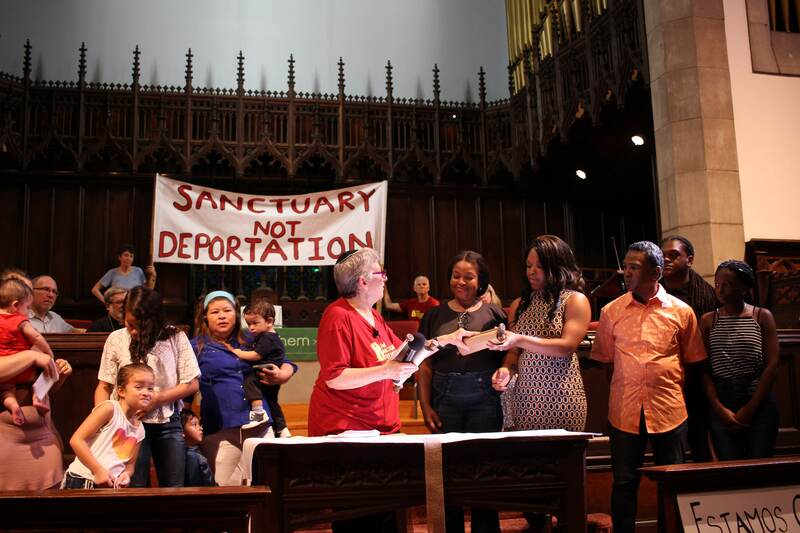 Many of our graduates have continued in leadership roles within New Sanctuary Movement, including serving on the board, becoming NSM staff members, and leading the campaign to end police/ICE collaboration and driver’s licenses for all. Leadership students have also spoken at rallies and to the media, testified at Philadelphia City Council, and planned immigrant justice actions. Themes included in New Leadership School include conducting one-on-one organizing meetings; house visits; identifying allies; planning campaigns and tactics; facilitation skills; meeting with elected officials; public speaking; talking to the media; different styles of leadership; and reflection tools.